The Victorians believed in progression and many were inspired by scientific and technological developments of the period. Sheffield and Birmingham became major manufacturing centres and one of their commodities was cutlery. Eating with silver cutlery became very fashionable because it was a good way of demonstrating wealth. Large parties were held with numerous dishes served in as many as 7 or 8 courses each requiring different cutlery. Knowing which piece to use when was very important. 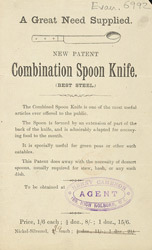 Novelties like the combination spoon and knife would have been popular.